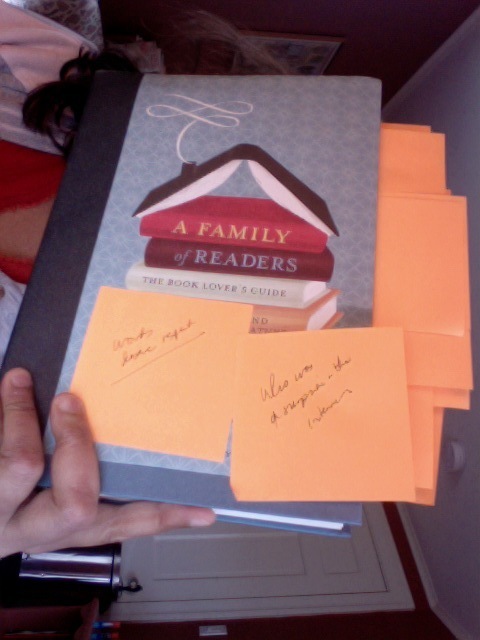 I devoured and post-it-ed my copy of A FAMILY OF READERS before today's noon chat with co-author Roger Sutton, editor of The Horn Book. Here are a few highlights of our slightly frenetic talk via Twitter. Please remember and excuse the limitation of 140 characters per tweet. I'm in italics, Roger is not, and I've edited for brevity and flow. Okay, Roger, first tell us about you. How long have you been Editor-in-Chief of The Horn Book? Why this book now? And why did you choose to target adults who love to read? Educators are reaching out to kids who live with adults who DON'T like to read. Suggestions for them? RS: Get them into the library, which houses plenty of right-thinking grownups. This guide is a superb endorsement for libraries. Where else can kids--with or without bucks--discover such joy and power? RS: The library was the center of my child life. Dedham Public Library, Dedham, MA. I love how A FAMILY OF READERS explores themes of power around children's books. RS: What do you mean by "power"? At one point, a contributor says "words deserve respect." You encourage adults to back off and let children and teens read in privacy. RS: I do think the greatest power we have is to read exactly what we want to ... I guess there *is* a lot of "you're not the boss of me!" in this book. "You're not the boss of me!" is a resounding cry of childhood, which is why this book is so much on the side of the child. RS: Once a coworker here told her son, "You're not my boss." And he said, "No, Roger is." A ringing message about power: a good story is on "the side of the child." A recent example from your nightstand? RS: I've just discovered Bill Bryson. Loving it. More than anything, this book empowers Kid/YA readers by illuminating the act of reading for gatekeepers. RS: Gatekeepers need to know books AND how to get out of the way. The role is to make sure the kids know there is a whole world of and in books, but never force them to read "for their own good." Ginee Seo and Bruce Brooks talk about a parent's freedom to put "crap in the trash." Isn't that too much adult power? RS: Every reading experience with young children is a transaction, yes? Parents are readers too. And don't forget a child's freedom to hide books from mom or dad. Were you peeking under the edge of the carpet under my bed when I was reading in Flushing, Queens, Mr. Sutton? RS: I respect the privacy of bedroom reading! But if a parent is "trashing crap," then the parent's definition of crap is ruling the reading of the house, right? "Given the chance, kids will read the same way adults do: for themselves." Why is reading well essentially for self? RS: Because that's the one person we can actually control. You tell parents to leave the reading teen alone, saying fiction is never a "how-to" guide. What effect does it have, then? RS: More like a "what if?" guide. You also say, "'YA literature' has never been been synonymous with 'what teenagers read.'" Any other synonym, then? RS: YA lit is about coming of age, for the most part. Teens like to read about other themes, too. Enjoyed the essay by Robert Lipsyte on how books helped him widen his definition of masculinity. RS: Books helped me feel like a "real boy," something I periodically doubted. You tell Katherine Paterson that her books are more "family fiction" than "children's fiction." Elaborate? RS: Used to be books were published with the whole family, say 9 years and up, in mind. RS: Holes, Year Down Yonder, The Yearling, Cheaper By the Dozen. It was liberating to read how Coe Booth wanted to grow up to be the black Judy Blume. RS: I think Coe Booth is one of our new truly great writers. Naomi Shihab Nye says: "Poetry was not trying to get us to do anything, it was simply inviting us to think, and feel, and see." RS: Poetry is really radical that way. Marc Aronson says the graphic-novel memoir as genre holds promise. Do you agree? If so, why? RS: I love comic books--hope graphic novel respect does not disallow this outlaw literature for children. Margaret Mahy talks about the "accumulated power of a story" for the reader. What did she mean? RS: I think she was talking about what a story continues to gain even years after you first read it. Martha makes the case that the page turn puts the child in power of the pacing of a story ... unlike movies or television. RS: Yes, you go as fast or as slowly as you please, you skip, you go back, you read twice ... *THAT'S* power. But even TV? Don't be a killjoy. RS: Yes, that's why I don't really enjoy books like Harry Potter that try to color in absolutely everything. Leave room! Like, you, Mitali, did a great job with providing just enough scenery description in Bamboo People. Tell me what I'm looking at but let me imagine it for myself. Will we lose "the power of a page turn" in a digital age? RS: I think digital media will give us a new way to turn pages. Jean Gralley wrote brilliantly for us about digital picture books a couple of years ago, and I wrote an editorial this month about digital publishing. In the book, Jon Scieszka says, "Design sets the tone for everything." How so in a digital age? RS: Digital books have to look like themselves, making best use of their own medium. I hate the stupid page turn animation in iBooks. "It's an iBook, Jackass!" You interviewed several Kid/YA book stars. Anything surprise you in one or two of these conversations? RS: I'm always surprised in author interviews--how different people are when they write. Serious writers can be a scream, quiet writers can be wicked. I'd love an example of how someone's interview differed from their writing, but feel free to skip. RS: All I'll say is, Maurice Sendak tells a dirty joke better than anyone I have ever met. I loved Jon Scieszka's joke about the bell-ringer. Lovely to picture him as a fifth-grader with that choice: an "A" or a laugh. RS: Always go for the laugh. "A"s are far more fleeting. Since you started at The Horn Book, what's one positive change you've seen in this industry? RS: Wider doors are letting in the crap but also all kinds of voices. Full disclosure: my essay on how a few fictional BFFs gave me courage to achieve womanhood is in A FAMILY OF READERS. I'll close with a Maurice Sendak quote in this brilliant book: "Absorption in creating is the actual reward." A great reminder for writers. Thanks, Roger and Martha, for this timely and inspiring guide.